I am approaching my last full week in Canada and my sense of the situation has progressed from denial and grief to acceptance. I am sure that the psychologists out there could precisely pinpoint which part of the 'death' scale I am currently at - except of course I am not dying. Well, not in the literal sense anyway. It is true that I was viewing my move from Canada as a type of sudden death. The quickness of the offer, decision, and the planning to move has happened so suddenly that I have felt as if I was in a fog for the last couple of weeks. I have been performing tasks and errands without being mentally present in them. It has been rather surreal. I think one of my fears was forgetting my time here. I know that's not possible, but it was still a fear. Would I forget what it was like to wake up and see the mountains? Would I forget the reds of the maples in fall? Would I be able to remember the smell of the stink lillies, or the pine sap as I ran in the forest? They were minor, inconsequential fears. I admit it. However, they were enough, that the thought of losing all that I had gained emotionally from living here, was enough to set terror in me. I didn't want to forget this place. I had my 'leaving party' last weekend. I was dreading the whole experience. I knew many would be upset and whilst still being in my disconnected frame of mind, I wasn't sure how I was going to deal with that. I was also dreading the event because it was the beginning of the end. The start of the move and I wasn't quite ready to accept that. There were tears - lots of them- and a lot of laughter. We took the entrance of seven burly policeman walking into the bar at 2am as a cue to leave, but this was not before I was given a very special gift by my friends. A bizarre gift I know, but one that was frankly a stroke of genius. I had been thinking of getting a tattoo to mark my time here, when we knew moving to the UK was a possibility, way back in March. I always knew what I wanted to get in a general sense. It was the word Orädd - which was the whole basis of registering for my first ever trail race. A race that still to this date was the toughest race I have ever run. Orädd is the Swedish translation for the word 'Fearless' or 'Intrepid', and in a way it summed up everything I have been over the last seven or so years. As I have thought about it over the last six months, the style and the location were also becoming more fixed in my mind. I wanted a typewriter or a print font to remind me that this was where I had started to write and I wanted it on my inside wrist, so that I could see it as I was running. To me, this seemed very fitting as my running and writing have become such a personal focal point for my sanity. I was lucky that I managed to get an appointment at 11am last Wednesday. I knew I was leaving pretty soon, but I also know they book up very quickly. I arranged to have the tattooing witnessed by some of the friends who brought me the voucher and then we were going to lunch. An 'Ink' then 'Drink' -but without the alcohol, I was picking up D later- event. At 10:50 I was still in the dentists chair with bite blocks and drills crowding my mouth. Nearly every tooth was worked on -at least half of them done without a local anesthetic. (The dentist was able to numb my upper jaw where the deepest of the old fillings were housed, but he didn't want to numb the lower jaw because I would be unable to eat or drink for up to 5 hours. The fillings didn't appear deep on the x-ray so there should be very little pain. According to the Dentist, the x-rays lied!) There were tears streaming from my eyes and I was beginning to wonder if I was really going to be able to have a tattoo without screaming. At 11:30, I staggered to the tattoo parlour, late and with a very bruised mouth. Luckily I was so rushed I didn't have time to be panicked. I met my friends outside and we went in. After filling in various forms, of which my friends gloatingly took photo's for future embarrassment value, I went into the actual studio. The tattoo artist already had my idea's on what I wanted and she just needed my verification before she started. Then it began. And my first thought was, "Okay, this isn't that bad. Isn't it meant to hurt more?" As she worked, the look on my face was of bemusement. I had psyched myself up to thinking this was going to hurt. A Lot! It didn't. Nothing more than a longer than expected cat-scratch. In fact I think at one point my friends were taking photo's of me pulling funny faces as the artist worked. As she finished, I quickly asked her. Could I have another on my neck? This was more of a sudden decision. The idea had come to me the night before. I had debated wether to get my Orädd tattoo on the back of my neck or on my wrist. The back of my neck was also a candidate, because this was 'my' private word -something just for me and not to show off. 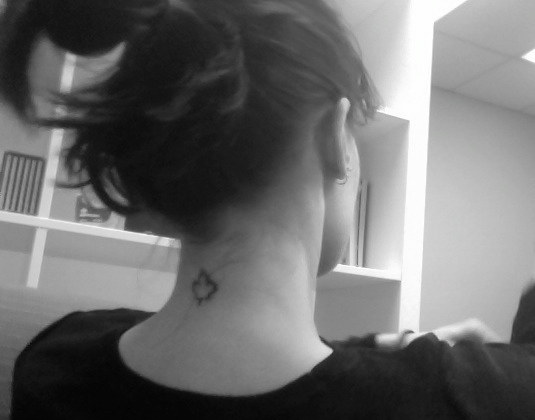 As I decided my wrist was the place, an idea came to me to have a Canadian maple leaf placed on the back of my neck. The artist came back with a maple-leaf outline which was just as I wanted it. I didn't want it shaded or in red - but just a leaf outline. In the end, instead of one tattoo I ended up with two. That night, I had planned on going out with a dear friend of mine. Alycia was D's aide in the first two years of school and I count her as D's 'Canadian Mum'. In school, she was the mamma bear and without her I would not have had any confidence on leaving D at the school. I knew she loved D like a son and she would protect D like a son -something I know she did despite the feelings held by others on the school staff. We went to the Movies; something we had been planning for months. The only film we could really see that was in both of our interests was 'The Odd tale of Timothy Green'. A chick-flick where a boy came unexpectedly into peoples lives, changed them forever and then had to leave. The boy in the film was so much like D, that we couldn't help but see the similarities. Little things, like the way he kicked the soccer ball, the way he flapped his arms on the diving board and the way he was socially quirky, were SO D, that the film hit us harder than we expected. D has changed both of our lives forever, and although not for me, for Alycia he has to go. It hurts and I could see that. Timothy Green came into the main characters lives from the garden. Grown from lost dreams and magical rain. His 'secret' was that he had leaves on his legs. Like a tree, the leaves grew strong, but as fall came they died and disappeared. When Timothy's last leaf fell he would disappear. At that point, I wondered if there was some hidden universal prompt that had made me suddenly decide to get a maple leaf tattooed on my neck. A reminder that like Timothy, there is a boy in my life that should be cherished because you never know when Autumn may come and one of us may have to disappear. A link to my friend who looked after him as a son; a further reminder of the connections our family has made. M isn't a fan of tattoo's and can't see the reason for them. In some ways, I could have said the same thing twelve months ago. However, yesterday and today, I understand. After Wednesday, there has been a mental calm. An acceptance of what is happening and the seeds of excitement of what is to come. I tried to rationalise why getting a tattoo was pivotal in this feeling, because despite any rationale, it does feel like that. These tattoo's are an important marker in my life. The only way I could express it was this: "Sometimes you need a physical scar before the mental scars can heal". I needed something tangible -something visible- to show what I have been through. It's a way of acknowledging what has happened, good and bad, and showing everyone that's it's mine. Taking ownership of my trials and treating them as something I have learnt from. Cathartic isn't a big enough word. I feel like seven years of trials have been taken off my shoulders and I no longer feel like I am battling and just existing till the next disaster. I am a survivor and I have the scars, albeit deliberate, to prove it.